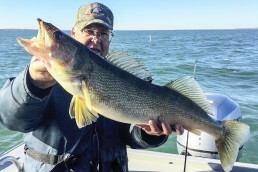 October in the Midwest is somewhat of an unusual month for fishing. It begins a transition period from the warm-weather months, into prepping all underwater inhabitants for the upcoming coldwater period, some of those months spent under a canopy of ice. Yes, the frozen stuff is what lies ahead. Those warm days on the water are soon to be just a memory of another summer season gone by. Hey, don’t shoot the messenger, it’s just a matter of nature doing its thing. Ahhh…I can hear the sounds of ice augers at sunrise already! 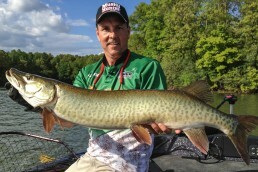 Seriously, as the water of fall begins to cool, fish sense the change of the upcoming cold-water months and their patterns of just weeks ago, begin to change. This seasonal transition, for the bank basser, can mean some incredibly successful days on the water. 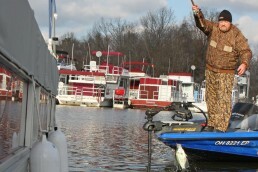 But, as an angler, you must key on the habits of bass during this particular time of the season. 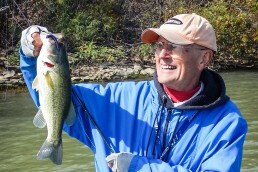 Things begin to change in the life of a bass during this summer to fall transition. 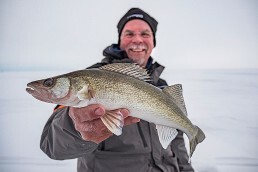 One, is that bass begin to move from their summer haunts in preparation of where they will spend the upcoming coldwater period and two, they begin to feed, and feed heavily, to build those much-needed fat reserves for the upcoming months under the ice. Before we get into baits, let’s just take a look at these two bass behavioral patterns that can increase your success this fall. The best advice I can give during this time of year, as far as bass location… I have no idea! Glad you took the time to read this article, aren’t you! What I mean is that bass are on the move now. Their location can be very unpredictable as they roam both shallow and deep water and all waters in between in search of food. 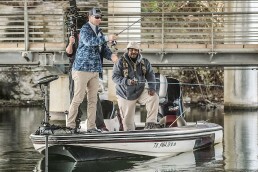 The first part of this warm to cool water transition has bass quite scattered and, because of this behavior, anglers need to be on the move just as their target fish are. As the waters begin to cool even more, bass will begin to stage close to deep water areas as part of their winter-month residencies. 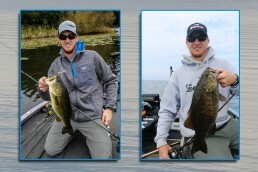 During the warm water periods, bass will often hit baits out of aggression or their dislike towards something being in their close proximity, not just to feed themselves. Now, all that behavior has been replaced with the internal need to pack on some weight. Bass have a totally different mentality than we, as humans, do. 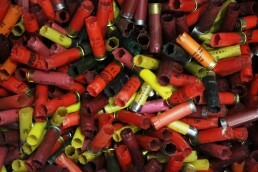 Before we head to wintering vacation areas, we like to drop a few. 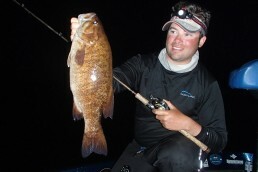 For bass, their main goal is to head into that cold-water season and holding areas as fat as their scales will allow!! 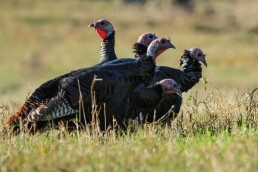 As far as food preference, much of that depends on the available forage in a body of water. Smaller fish, at least in my area seem to be preferred choice on the fall menu. Schools of shad, minnows, or bluegills seem to be favorite rather than searching the bottoms and heavy cover area for baits like crayfish. Because the bass key in on baitfish populations, I search the waters this time of year with my bait of choice for this article—the jerkbait. I like jerkbaits because I believe it appeals to the bass’ primal instinct in their search to fill their appetites. I’m not one of those bass anglers who pigeonholes certain baits into seasonal baits only. 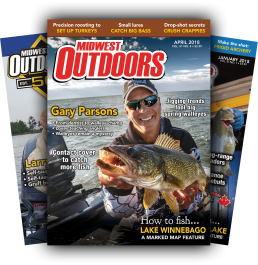 You’ll see things written somewhat as a bait-of-the-month exclusive in certain periodicals, I don’t follow these guidelines and use whatever bait suits my fishing at the moment, rather than the most-used “bait-of-the-month” concept. 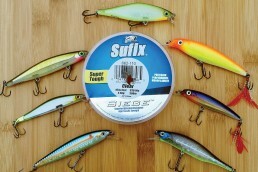 So, why the jerkbait as opposed to other search baits? Many anglers will use a bait such as a crankbait this time of year, and I can’t argue with their success. Nor with their ability to cover large amounts of water (which is critical to locating bass, this time of year). The jerkbait allows for me to cover just as much water. But, the considerably more dramatic action of the jerkbait, I believe, often draws bass from longer distances to investigate the bait. 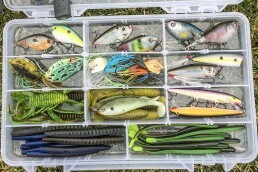 If you feel the crankbait is better suited for your type of fishing, then, by all means, keep crankin’, but at least keep in mind the goal of the bait itself: to cover a large amount of water and appeal to the bass’ feeding mode. Do you know a ‘jerk’ when you see one? Jerkbaits, if you don’t use them, are normally longer, minnow-shaped baits that will suspend once your retrieve has stopped. This is where the action comes from, in your ability to work that bait in a pause-and-ripping-type retrieve. If you are not familiar on how to work a jerkbait, let’s take a quick look at the mechanics of making one work. Make your casts out, preferably as far as you can. Reel down to get the bait down to the preferred depth. At this point, pause your bait. 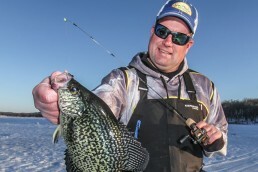 With the rod tip only, snap the bait back towards you in a series of quick, downward snaps of the rod. Let it pause again, then reel up your slack line. Never reel during the snapping action. Let your rod tip do all the work. When reeling up your slack line, leave a small section of slack. Don’t tighten down all the way, the bait works best on a slack line. 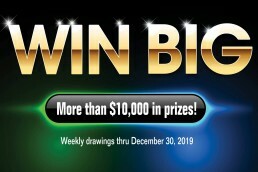 Takes a little bit of getting used to, but the rewards are awesome. 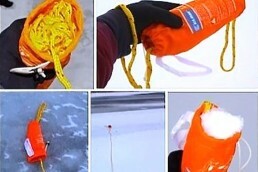 The gear you use is a critical part of jerkbaiting. Because you need to work the bait in a series of downward snaps of the rod tip, a long rod will give you nothing but frustration. While I’m a fan of long rods in many techniques, this is not one of them. 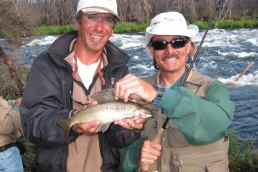 Your height and arm length play a factor in selecting the proper rod for your fishing. If you’re tall, a 7-foot rod might work well. You will be holding the rod higher off the surface when pointing down. For an example, I’m 6’1” and shrinking, pretty sure I am! 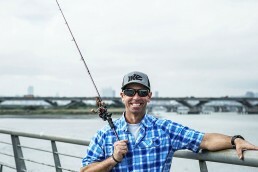 I use a 6.5- to 6-foot, 8-inch rod for my jerkbaiting. A 7-foot rod is constantly slapping the surface and messing with my cadence. 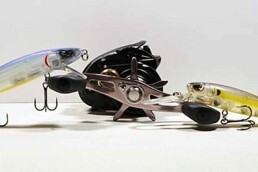 As far as rod and reel type, you can use either a spinning rod and reel setup or a baitcaster. Lately, for this rig, I have been using a baitcaster for most sizes of my jerkbaits. For small jerks, I do tend to use spinning gear. Gear ratios are not that critical, since the bait is worked with the rod tip only. But, a high-speed reel allows you to pick up the slack much quicker. It’s your choice, on this one. As for lines, this is an open-water presentation. My primary line choice is a 10# clear mono or copolymer. Some would say fluorocarbon is a must. It’s not worth arguing, for me. I’m not a big fan of fluorocarbon, just my thing. If you have confidence in it, by all means, go for it. Before we wrap up, a quick bit on where to use this jerkbait technique. Remember, as mentioned earlier, bass are coming out of some of their deep summer holding areas and moving through various depths of water in search of food. 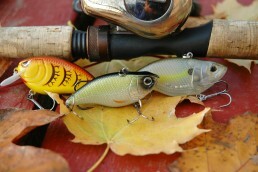 They will ambush schools of baitfish in some spectacular fall feed forays. If you’re near, you can benefit from these feeding sprees. In general, you just need to cover as much open water as possible until active fish are located. If you notice schools of roaming baitfish, stay close. The bass are rarely far away. You’re targeting larger areas of open water with this technique. 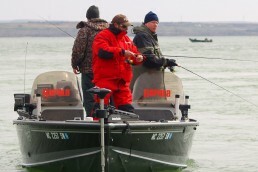 Since you haven’t established a feeding depth, work all areas of open water. Work from deep-water areas to shallow areas of open water as long as your bait can work properly. Bass will come up from considerable depths to hit a properly worked jerkbait. So, pay attention to your bait cadence whether you think your location is an active spot or not. Whether you’re a fan of the upcoming winter season or not, it’s still coming. Bass are fully aware of it. 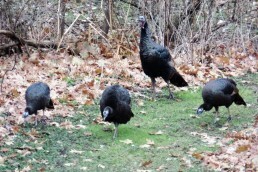 Appeal to their desire to pack on the pounds this fall season. Give jerkbaiting a try! Some of the biggest fish are caught in the fall. 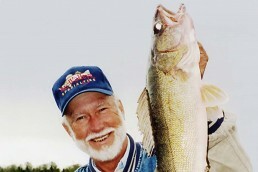 Hopefully you can experience one of your best fishing seasons ever!